In the design of the computer system, a processor, as well as a large amount of memory devices, has been used. However, the main problem is, these parts are expensive. So the memory organization of the system can be done by memory hierarchy. It has several levels of memory with different performance rates. But all these can supply an exact purpose, such that the access time can be reduced. The memory hierarchy was developed depending upon the behavior of the program. This article discusses an overview of the memory hierarchy in computer architecture. The memory in a computer can be divided into five hierarchies based on the speed as well as use. The processor can move from one level to another based on its requirements. 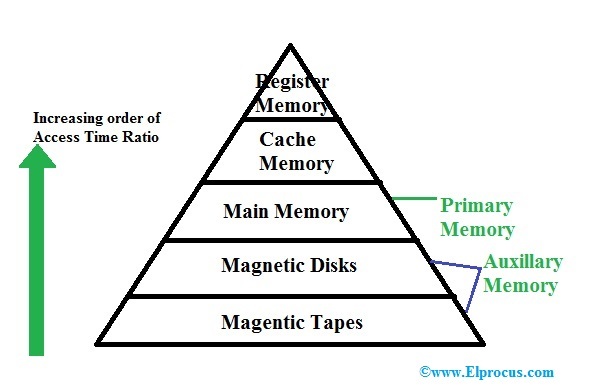 The five hierarchies in the memory are registers, cache, main memory, magnetic discs, and magnetic tapes. The first three hierarchies are volatile memories which mean when there is no power, and then automatically they lose their stored data. Whereas the last two hierarchies are not volatile which means they store the data permanently. A memory element is the set of storage devices which stores the binary data in the type of bits. In general, the storage of memory can be classified into two categories such as volatile as well as non- volatile. The memory hierarchy design in a computer system mainly includes different storage devices. Most of the computers were inbuilt with extra storage to run more powerfully beyond the main memory capacity. The following memory hierarchy diagram is a hierarchical pyramid for computer memory. The designing of the memory hierarchy is divided into two types such as primary (Internal) memory and secondary (External) memory. The primary memory is also known as internal memory, and this is accessible by the processor straightly. This memory includes main, cache, as well as CPU registers. The secondary memory is also known as external memory, and this is accessible by the processor through an input/output module. This memory includes an optical disk, magnetic disk, and magnetic tape. The memory hierarchy characteristics mainly include the following. Previously, the designing of a computer system was done without memory hierarchy, and the speed gap among the main memory as well as the CPU registers enhances because of the huge disparity in access time, which will cause the lower performance of the system. So, the enhancement was mandatory. The enhancement of this was designed in the memory hierarchy model due to the system’s performance increase. The ability of the memory hierarchy is the total amount of data the memory can store. Because whenever we shift from top to bottom inside the memory hierarchy, then the capacity will increase. When we shift from bottom to top inside the memory hierarchy, then the cost for each bit will increase which means an internal Memory is expensive compared with external memory. The memory hierarchy in computers mainly includes the following. Usually, the register is a static RAM or SRAM in the processor of the computer which is used for holding the data word which is typically 64 or 128 bits. The program counter register is the most important as well as found in all the processors. Most of the processors use a status word register as well as an accumulator. A status word register is used for decision making, and the accumulator is used to store the data like mathematical operation. Usually, computers like complex instruction set computers have so many registers for accepting main memory, and RISC- reduced instruction set computers have more registers. Cache memory can also be found in the processor, however rarely it may be another IC (integrated circuit) which is separated into levels. The cache holds the chunk of data which are frequently used from main memory. When the processor has a single core then it will have two (or) more cache levels rarely. Present multi-core processors will be having three, 2-levels for each one core, and one level is shared. The main memory in the computer is nothing but, the memory unit in the CPU that communicates directly. It is the main storage unit of the computer. This memory is fast as well as large memory used for storing the data throughout the operations of the computer. This memory is made up of RAM as well as ROM. The magnetic disks in the computer are circular plates fabricated of plastic otherwise metal by magnetized material. Frequently, two faces of the disk are utilized as well as many disks may be stacked on one spindle by read or write heads obtainable on every plane. All the disks in computer turn jointly at high speed. The tracks in the computer are nothing but bits which are stored within the magnetized plane in spots next to concentric circles. These are usually separated into sections which are named as sectors. This tape is a normal magnetic recording which is designed with a slender magnetizable covering on an extended, plastic film of the thin strip. This is mainly used to back up huge data. Whenever the computer requires to access a strip, first it will mount to access the data. Once the data is allowed, then it will be unmounted. The access time of memory will be slower within magnetic strip as well as it will take a few minutes for accessing a strip. The need for a memory hierarchy includes the following. Thus, this is all about memory hierarchy. From the above information, finally, we can conclude that it is mainly used to decrease the bit cost, access frequency, and to increase the capacity, access time. So it is up to the designer how much they need these characteristics for satisfying the necessities of their consumers. Here is a question for you, memory hierarchy in OS?